One of the best at Surfside, Spring Break Apr 6-13 open! Make an offer! STUNNING KITCHEN RENOVATION, GRANITE & NEW CABINETS IN BOTH BATHROOMS, REPAINTING OF ENTIRE UNIT, AND NEW LIVING ROOM FURNITURE. LOOKS & FEELS LIKE NEW! 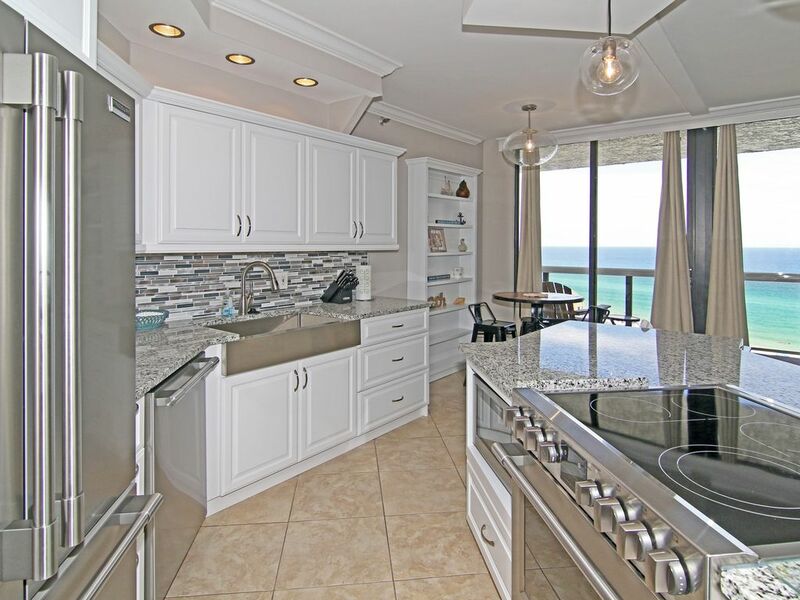 Come and enjoy our spacious 2BR/2BA 1151 square foot condo on the 12th floor of beautiful Surfside Resort located in the calmer, less congested Miramar Beach section of Destin, FL. Our southeast ocean view from our 8' x 28' private balcony is unobstructed by buildings and SPECTACULAR! We get the morning sun and afternoon shade so enjoy your morning coffee out on the balcony and return later to relax in the afternoon shade. Enjoy the wonderful sights and sounds of the ocean and gaze down the southeastern Gulf Coast shoreline all the way to Panama City! All rooms have balcony access due to the unique floorplan of this unit. Our interior is all tile flooring with new comfortable and family friendly furniture and decor. The huge master bedroom includes a king size bed, 32" flat screen SMART TV/DVD combo, walk-in lighted closet, dressing area, vanity table, and large master bath with tiled walk-in shower. A full size washer/dryer unit is in master bath. The second bedroom has two double beds with large closet and bathroom with tub/shower combo. It also has a 36" flat screen TV and DVD player. The second bedroom can be locked out and has its own entrance. Our new AMERICAN LEATHER COMFORT SLEEPER sofa in the living room opens into an extremely comfortable queen-size bed. An awesome 55" curved ultra HD 4K high def SMART TV (Netflix Hulu, Spotify, YouTube) , Blu Ray DVD player, games and puzzles all in living room for entertainment. Dining room has mirrored walls which provide a great view from all seats. The fully-equipped kitchen has brand new high end appliances and everything you will need for cooking and/or entertaining including a KEURIG coffee maker! We offer FREE Beach Service (2 chairs and 1 umbrella) March 1 - October 31. SURFSIDE RESORT is an all-inclusive property including a FITNESS room with gym equipment, SPORTS deck (tennis under the lights, shuffle board, basketball) above a COVERED & secure parking deck, large HEATED POOL and deck area, two HOT TUBS, a KIDDIE pool, TIKI HUT food and beverage service and a pool house with showers and sauna. Also, Surfside is the ONLY PROPERTY IN DESTIN with FIBER OPTICS run to every unit and a secure WiFi connection! Crossover the SKYBRIDGE/catwalk from the pool deck to the SUGAR WHITE sand and EMERALD GREEN waters of the Gulf of Mexico. Surfside now offers BEACH WEDDINGS and RECEPTIONS in the new beautiful event VENUE catered by Royal Palm Grille restaurant. Golf next door at Seascape. Handicapped and truly wheelchair accessible (including roll-in shower). Additional photos available via email if desired. Chris Zimmer from Roswell, GA. I have 2 daughters ages 16 and 19 who love going down to Surfside and hanging out on the beach and at the pool. We bought our condo in 2004 and love our spectacular view and private balcony. Miramar Beach section is less congested, great views of the ocean, Surfside building is rock solid and built to Category 5 Hurricane standards. Unique layout of floor plan has sliding doors from all rooms out to the balcony. Skybridge from pool deck to the beach, fantastic restaurant in the building, (enjoy breakfast, lunch or dinner on the beautiful new dining deck) awesome view, all rooms open out to private balcony. 8 x 28' private balcony with unobstructed view of the ocean. Both bedrooms, kitchen and living room area have sliding glass doors that open out to the balcony.